Here’s a big dog with an even bigger heart! Meet Buddy Boy, our Animal Friends Pet of the Week. 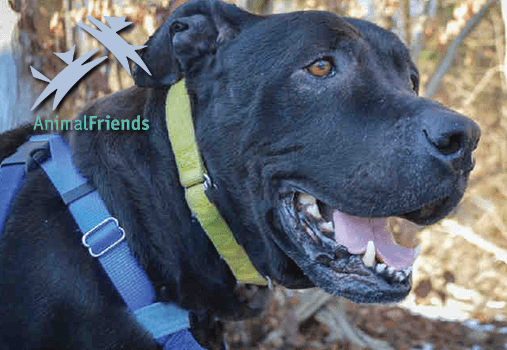 He is a 9 year old Black Lab/Pit Bull mix. He is one big, handsome and lovable dog! Buddy Boy was brought to Animal Friends after a previous owner couldn’t care for him anymore. He spent most of his life outside, and he is looking for a house that will give him tons of love as he gets older! He can be a rowdy player, and he’s probably good with other dogs! He would need to be in a home with kids ages 12 and up. The best thing about Buddy Boy is that he LOVES meeting new people, head scratches, and car rides! If you would like to adopt Buddy Boy, check out his page HERE. For all animals looking for a home, visit ThinkingOutsideTheCage.org.